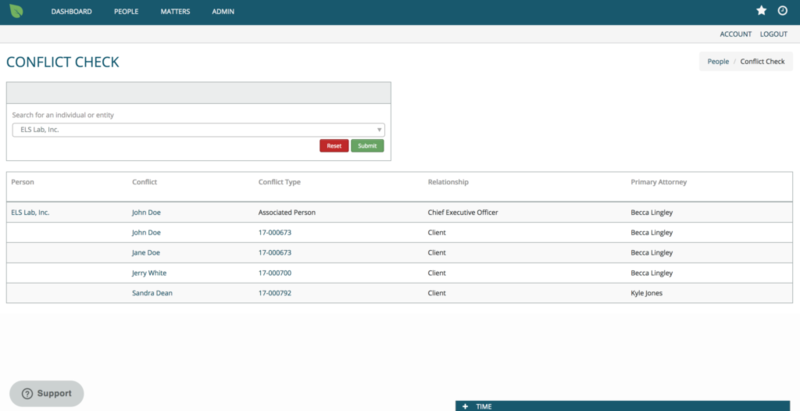 A new Client Conflict Check Feature has been built in Denovo. To utilize the new Conflict Check, navigate to People. Click the Conflict Check button on the top right of the screen. Complete a Conflict Check search for either a Person or an Entity. Details display of where the conflict resides (Person or Matter) and the type of conflict (generated from Associated Person information). The Matters view has been revised. Status is now located at the far left and is identified by a colored dot: green for open, red for on hold, and gray for closed. This change makes some additional space for a future location column display. Matters now can only be deleted from the Matter Details of each individual Matter. Added a toggle to hide archived practice forms on new Matters. A new field is available within each Matter’s Matter Details view. A Matter can now be associated to a Location. The Location Name(s) available in the Organization display as a drop-down for selection. New Columns have been named and populated within the Xero Export for tracking field 1 and 2. Field One now populates with the Attorney First Name and Last Name, while Tracking Field 2 is now named with Location. Other slight revisions have been made to the Xero Export. Time Cards, People, and Matter records are all now soft deleted in Denovo. For now, caution is still encouraged when deleting a Matter, a Person, or a Time Card as they cannot be retrieved by Denovo users at this time. In the future, Org Admins will have the ability to undelete these items if deleted by users in error. Search improvement functionalities have been deployed across Denovo to improve performance and timeliness of searches. Read our full Release Notes or contact us at sales@denovo.io with questions or to learn more about all that Denovo offers. Denovo is designed to eliminate common pain points for attorneys by focusing on adding value where it matters most. Denovo offers streamlined and efficient matter management software for the solo practitioner and small law firm. Created by lawyers for lawyers, with a focus on ease of use and effective contact management, matter management, time tracking, turnkey document automation, document storage, and more. Explore our Features and sign up to receive updates on our development.